Heat oven to 375°F. Spray 13x9-inch (3-quart) glass baking dish with cooking spray. Cook rice and corn as directed on bags. 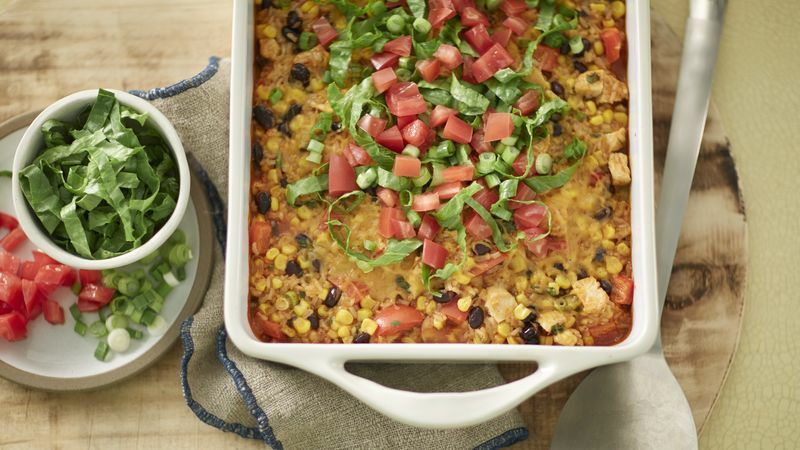 In baking dish, carefully stir rice, corn, beans, chicken, enchilada sauce, bell pepper, 2 tablespoons of the green onions, the cilantro, chili powder, cumin, garlic powder and 1 cup of the cheese until well blended. Bake uncovered 30 to 35 minutes or until bubbly and heated through. Sprinkle with remaining 1 cup cheese; bake 3 minutes longer or until cheese is melted. Top with shredded lettuce, tomato and remaining 2 tablespoons green onions.